Why GreenLight Solar & Roofing? GreenLight Solar & Roofing is one of the Pacific Northwest’s fastest growing energy efficiency and solar power providers servicing the entire state of Oregon and Washington. We make clean energy available to homeowners and businesses with no upfront costs and typically less than they pay for energy generated by burning dirty fossil fuels. Our goal is to install solar systems using the best products in the industry while making the switch simple for our customers. We are changing the way energy is delivered by giving customers a cleaner, more affordable alternative to their monthly electric bill. GreenLight Solar & Roofing believes that everyone should control their own power. We believe that instead of paying more money each year for power people should have a choice. We offer you a way to take control of your monthly electric bill by installing solar on your home. You can reap all the benefits of solar without having to spend any money up front. Get started for as low as $0 down. Installation, monitoring and repairs are fully covered for the next 25 years. We also offer: electric car charging stations, solar attic fans, insulation, heat pumps, water heaters and more. To see if solar makes sense on your home, or what energy savings products you can benefit from click HERE. 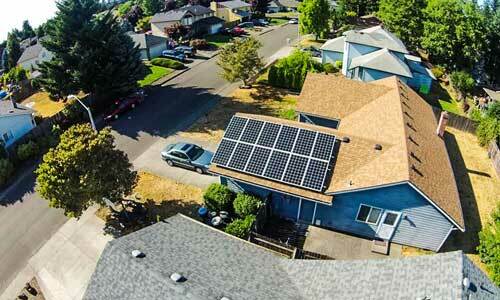 At GreenLight Solar & Roofing we are changing the way the Pacific Northwest uses energy. Currently, we service the entire state of Oregon and Washington and provide turnkey solar solutions to all homeowners, most with little to no upfront cost. We believe everyone should have the opportunity to go green and do their part to help save the environment and cut carbon emissions. If you are looking to switching over to solar power or need a whole home energy efficiency upgrade, we are here to help. GreenLight Solar & Roofing provides the highest quality solar products on the market today. Our solar panels come with a manufacturers production warranty of 25-years and all of our roofing products come with a full 50 year warranty. All our solar panels come with monitoring software so you can get real-time data on the performance of your system. Our installers have over 40 years of combined experience installing solar panels in the Northwest and our installations show it. We are one of the only solar companies in America that stands behind our work with a 10-year workmanship warranty. GreenLight Solar & Roofing is an allied member of the Oregon Energy Trust and proud member of Solar Washington.